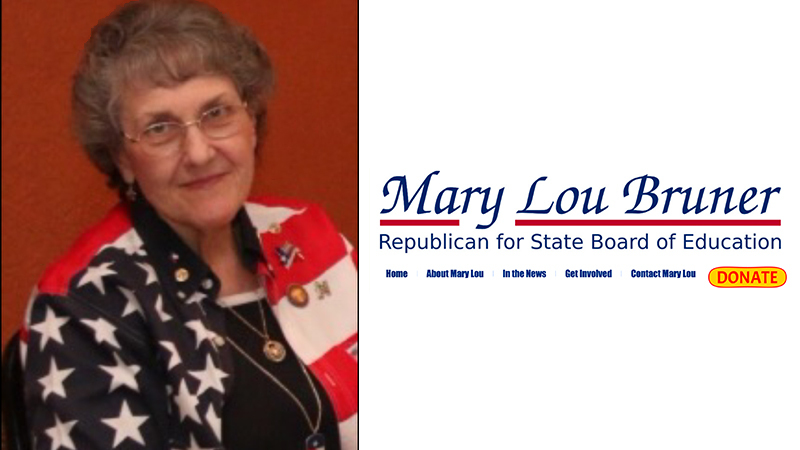 We told you last week about the outrageous things Texas State Board of Education candidate Mary Lou Bruner publicly claims on her Facebook page. Among them: that President Obama was a gay prostitute so that he could fund his drug addiction, that Democrats conspired to assassinate President Kennedy, that evolution “is a religious philosophy … supporting the religion of Atheism,” and that climate change is a hoax Marxists are using to take over the world. The Texas Freedom Network’s name is very misleading. Texas Freedom Network is controlled by radical liberals who believe Freedom of Speech and the other rights listed in the Bill of Rights are only for liberals and progressives, not for conservative Americans. TFN believes conservative Americans should allow the liberals to have their way on every issue because if liberals do not get their way they throw a fit. As the State Board of Education prepares this week to vote on which new social studies textbooks to approve for Texas public schools, we are encouraged that publishers are making a number of changes to problematic passages in their texts. In each of these instances, publishers are responding to serious concerns by scholars working with the Texas Freedom Network and coalition partners. Reviewers at the National Center for Science Education identified textbook passages from four publishers that would mislead students about the real and growing threat of global climate change. The passages included inaccurate information on climate science and promoted climate change denialism. Three of the publishers, including major publisher Pearson Education have submitted revisions correcting those problems. The fourth publisher, McGraw-Hill, has indicated that it will revise a particularly problematic passage in its Grade 6 World Culture and Geography textbook, but we are waiting for details. Taken together, these changes would represent a major victory for science education over the political arguments of climate change denialists. You already know it’s a presidential election year. It’s also an election year for the Texas State Board of Education (SBOE), with eight of the board’s 15 seats on ballots all across the state this November. SBOE races don’t always get much attention, which is unfortunate because if you’ve followed us here you probably know how important — or how much of a headache — the board can be. The board has the power to decide what’s taught to more than 5 million public school students, and throughout the years some SBOE members haven’t been shy about pushing the culture wars into the classroom. So with that in mind, if you live in SBOE districts 1, 5, 6, 8, 9, 10, 14 or 15, you can vote for an SBOE member this year. In districts 14 and 15, you won’t have a choice on who to vote for as both incumbents — Sue Melton-Malone, R-Waco, and Marty Rowley, R-Amarillo — are unopposed. The rest of you will have contested SBOE races on your ballots.